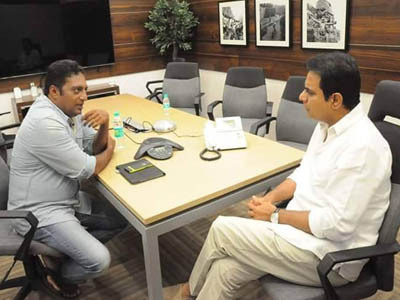 Actor Prakash Raj on Monday decide to adopt a village in the backward Mahabubnagar district of Telangana. He called on Panchayat Raj and Information Technology Minister K. Tarakarama Rao at the state secretariat and expressed his desire to adopt Kondareddipalle village in Mahabubnagar. The polyglot actor, who recently launched Prakash Raj Foundation, plans to undertake various programmes for the development of the village. Rama Rao said on his official Facebook page that he lauded the idea of Prakash Raj and introduced him to District Collector Sridevi and legislator Anjaiah. He also shared pictures from the meeting. Prakash Raj told the minister he plans to carry out agriculture in the village by using the latest technology. According to an official statement, he said he would work with the government to help farmers and provide basic amenities in the village. He said the people from his foundation were surveying the village and once the survey is completed, he will announce what he actually plans to do. The actor lauded Grama Jyothi, a programme launched last month by the state government for rural development. He explained the activities being undertaken by the foundation in Karnataka. He agreed to a suggestion made by Tarakarama Rao, who is son of Telangana Chief Minister K. Chandrasekhar Rao. The suggestion was made by the minister after Mahesh Babu announced that he will adopt Burripalem village in Guntur district of Andhra Pradesh. Burripalem is the birth place of Mahesh Babu's father and veteran actor Krishna.